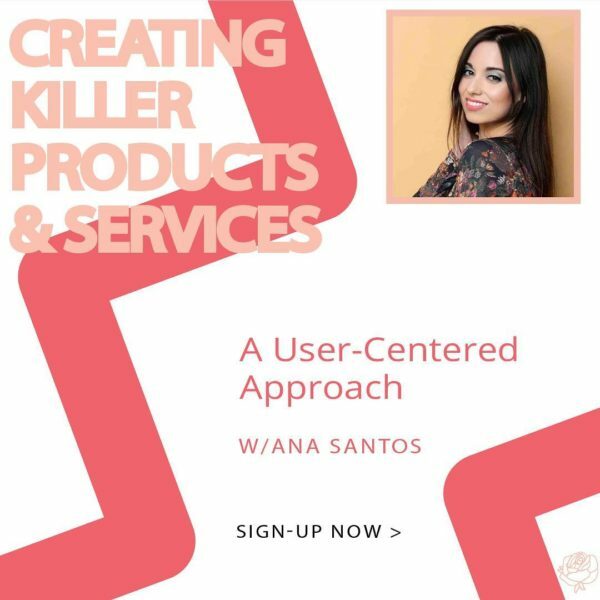 How to create better products and services using a user-centered approach. I joined many courses and books about creating products… but so far this course is the best, I understand many things I did wrong with the product I was trying to sell in the past but now I know why thanks to your course and you Ana. This course is well explained and easy to understand just need to keep the following each step and rule mentioned on the course. I learned about the 5 stages of design thinking, solve problems, identify user needs and goals, how to find the ideal clients and where to find them, useful thing to avoid and much more…. I’ve never been through an influencer course that was so thorough and to the point! Ana had visual aids and real life examples that helped me to fully grasp the information. She was also very good at engaging with the class. I don’t typically like online courses because I get distracted, but the information was so rich and easy to understand, she kept my attention the entire duration! Ana’s course was extremely helpful. She provides worksheets, great visual aids as mentioned by other reviewers, and she is a great presenter. During her session, she stopped many times to answer questions and dive deeper. I have a ton on experience in the tech space and understand the basics of user design but i still I learned a lot during my session with Ana. She talked about user empathy mapping, which most start-ups (mine included) skip over during the process of developing a product or solution. I wanted more insight on this topic so I could try it with my team. Ana allowed me to take the conversation offline and into the Zoe Elle slack channels, where she went in even deeper into the topic and gave me ideas on how to start conversations with my team in future meetings. I highly recommend this session with Ana and look forward to new and upcoming sessions.